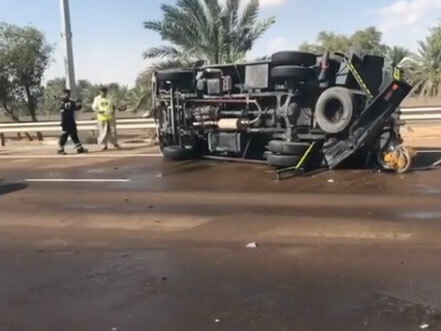 Abu Dhabi: Three motorists sustained minor injuries after their vehicles collided with a petrol tanker, causing it to flip and bump into a police patrol that was parked on the hard shoulder. The accident happened on the Al Ain - Abu Dhabi Road in the area of Al Khazna. According to police, the three vehicles did not maintain enough distance and crashed into each other on the highway. The vehicles then bumped into a petrol tanker, which was pushed out of the lane and on to the hard shoulder. The petrol tanker then collided into a police patrol that had finished attending to a previous traffic accident in the same area. The motorists sustained mild to moderate injuries, and were transported to Mafraq Hospital for treatment. Lieutenant Mohsen Al Mansouri, deputy director of Al Ain’s traffic department, urged motorists to adhere to the speed limit, pay attention to the road at all times, and to leave sufficient distance between vehicles to avoid traffic accidents.